If you are a fan of the tiny, little, obscure British band, The Beatles (occasionally you hear them mentioned today), or are a fan of bizarro animation—or even if you just like puns—then it is absolutely imperative that you view The Yellow Submarine (1968). With director Charles Dunning’s team’s incredibly lucid and inventive animation (inspired by the artistic styles of Heinz Edelmann) and some great songs from the legendary Beatles this super-mellow psychedelic trip of a film was brought to glorious, acid-dropping life. The film follows Richard Lester‘s two previous live-action films, The Beatles, A Hard Day’s Night (1964) and Help! (1965). 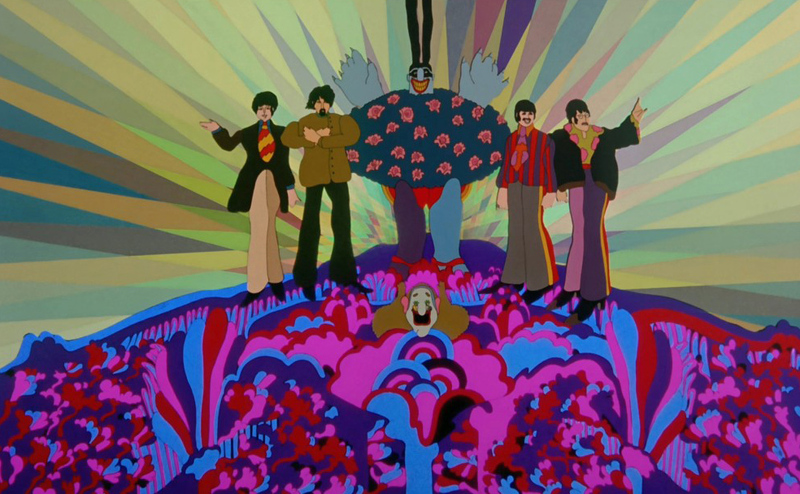 Like these films, Yellow Submarine would be a wild comedy with loads of silly Beatle antics, but this time it would be animated, rendering complete free range over the psychedelic tone and tundra. The Beatles themselves were not terribly keen initially with the idea of the film, so their speaking voices in the film were cast to other actors doing Beatles impressions (John Clive, Geoffrey Hughes, and Paul Angelis). Evidently, when the film was nearing completion the real Beatles saw the footage and loved it and thus agreed to appear as live action cameos at the finale. If the ringing endorsement from John Lennon, Paul McCartney, George Harrison, and Ringo Starr isn’t enough, then I don’t know what would be. The film features several fantastic songs including “It’s Only a Northern Song,” “Eleanor Rigby,” “Lucy In the Sky With Diamonds,” “Nowhere Man,” “All Together Now,” “When I’m Sixty-Four,” “Yellow Submarine,” and more. Like many band-centric musicals, the plot takes a comfortable backseat to much of the music and mayhem, but the plot is still enjoyable enough on its own. Peaceful Pepperland is under attack by the nasty Blue Meanies who have zero tolerance for anything but rampant negativity. They set strange monsters out into Pepperland and bean all of the citizens with big, green apples, transforming them into silent, blue statues. Fortunately, Old Fred, the sailor, gets away in the Yellow Submarine. Advised by the Mayor to get help, he sails through land, air, and sea until he discovers Ringo. Ringo takes Old Fred to the Beatle house where he meets George, John, and Paul. 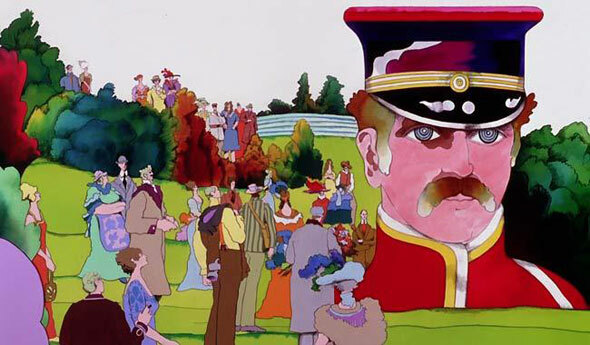 Old Fred is struck by the foursome’s uncanny resemblance to the former protector’s of Pepperland: Sgt. Pepper’s Lonely Hearts Club Band. Together they go on a quest to find Pepperland again and free it from the Blue Meanies. Naturally some singing is required for the trek as they sojourn across the Sea of Time to the Sea of Science to the Sea of Monsters to the Sea of Nothing to the Sea of Heads to the Sea of Holes to the Sea of Green. After “Eleanor Rigby” I’d say that some of my favorite songs are featured on their path through the seven seas. 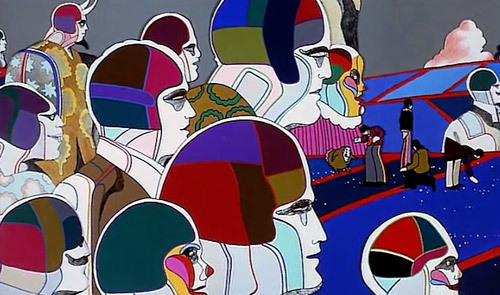 Once they arrive in Pepperland the Beatles must use the power of music and love to set the Pepperlanders free and bring happiness to the oh-so-blue Blue Meanies. If all you need is love then certainly we can all get along, right? In a time when all violence, hate, and wars can be solved by flowers, long hair, and drugs, Yellow Submarine proved to be another megaphone expounding on the subject. It heralds a message that can be enjoyed by young and old alike. The bad guys are never really bad, they just need to see what they’re missing in order to come around. Yellow Submarine proves you don’t need rigorous conflict to tell a fun story (just like David Byrne’s True Stories). Indeed, the ‘battle’ between The Beatles and the Blue Meanies’ minions is the least interesting part of the movie. The exciting bits come from their mind-altering explorations through the Seas and the songs they sing along the way. The film achieves a sort of ultra-relaxed mellow. The world is fantastical enough on its own so why fight? The film voices the generation’s creed better than most. This movie is what the hippie ideology was all about. Make love, not war…because war is unnecessary and evil and love permeates every aspect of peace, kindness, and understanding. It’s a tough toss up as to who the real star of the movie is. Is it the music or the pictures? The animation morphs and contorts with such lushness and playful abandon that it dazzles the eye and tickles the funny bone and remains completely in step with the songs. Some of the songs are so wonderfully hypnotic, delirious, and playful that, perhaps, without them the pictures would feel incomplete. The perfect marriage of music to picture is nothing short of amazing. Yellow Submarine is like a pop version of Disney’s Fantasia. The colors and shapes are completely free and wild and it might prove difficult to refrain from joining in and singing some of the classic tunes. “It’s all in the mind,” so the recurring line goes. People have said that this movie is just about drugs, specifically LSD. I think this is unfair, for although there is logic behind the assumption considering the era and source of much of the material, I submit that it is more a celebration of the imagination and creativity (which some might argue is the purpose of LSD, but it would still merely be the train rather than the destination). You don’t need drugs to see the magic. It’s already there. Lewis Carroll, M. C. Escher, and Terry Gilliam didn’t need it. 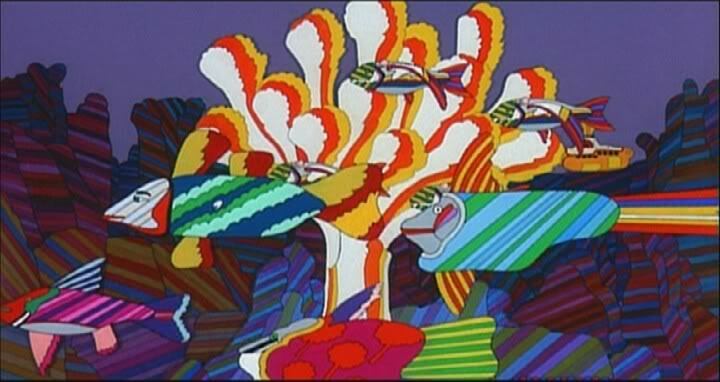 Perhaps the filmmakers of Yellow Submarine were simply reveling in the fact that animation could do anything. The movie is more about the magic of a perfect world where everything is peaceful, musical, and mellow. Yellow Submarine is brisk, funny, and full of wonder. A good movie takes you places and Yellow Submarine definitely does that. It’s a highly imaginative and enjoyable experience. It’s weird, wild stuff and it won’t be for everybody, but if you like the message, the incredible artwork, or great Beatles songs then check it out. (On a personal note, I do wish “Strawberry Fields” was in this movie). Perhaps the hippie lifestyle isn’t as prevalent as it was in the 1960s when this film came out, but then perhaps there are certain messages that we can all get behind no matter what part of the century we’re from. Make love, not war. All you need is love. It’s all in the mind. Thank goodness the CG motion-capture Disney-Zemeckis remake was cancelled. 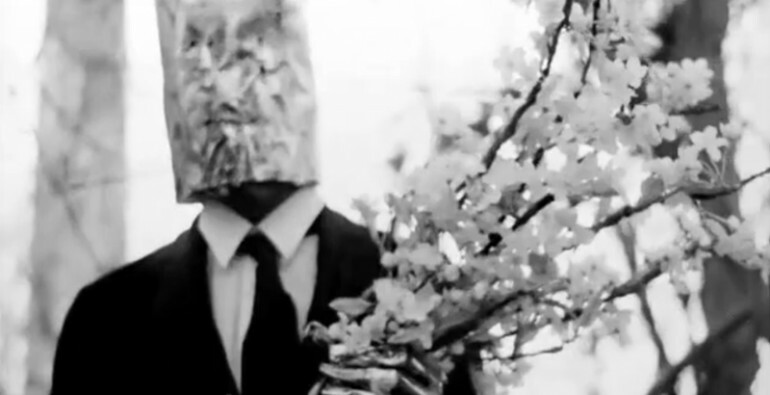 From Ivan Maximov to Kenneth Anger, some filmmakers excel at the short subject movie. The short film is a tricky beast and not everyone can be so succinct. I like short films and I admire the ingenuity behind the best and most clever ones. Here are a few. I Met the Walrus (2007) was directed by Josh Raskin and was animated by James Braithwaite and Alex Kurina. So what is the film? 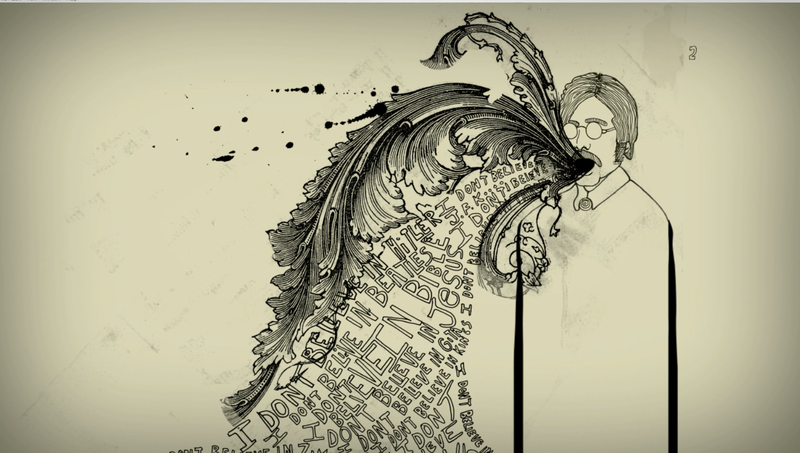 It’s an animated interview with John Lennon. The film opens with a text informing the viewer that what they are about to hear is 14 year old Jerry Levitan (the film’s producer) talking to a candid John Lennon back in 1969. Basically the recorded voices are used as a backdrop for the visual tapestries that will follow. The artists behind I Met the Walrus work very hard to animate Lennon’s words as a sort of illustrated stream-of-consciousness that mirrors both Lennon’s train of thought and Levitan’s impression of the words being spoken. What starts out as a fairly novel idea by itself is stretched to the limits. Every thought, sentence, and syllable moves the vibrant canvas forward. Pictures are upside-down, right-side up, sideways, dancing, still, and all at once converging into the next idea as they are prompted to expand by Levitan’s questions. You get a real sense of the real John Lennon and see his logic unfold and build. Braithwaite handles all of the pen art while Karina manipulates all of the computerized illustrations and together they make the decades old interview feel as alive and trippy as if it were happening today. I Met the Walrus is a magical expedition into the mind of one of the most celebrated 20th century musicians and the filmmakers do a smashing job transporting us there. (approximately 5 minutes). The next film hails from Russia and combines the brilliant animation of Aleksandr Petrov and the American story by Ernest Hemingway, The Old Man and the Sea. 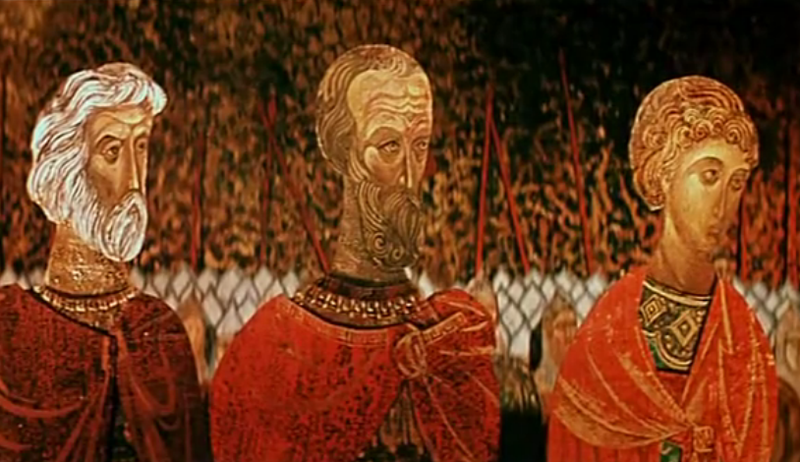 This film was released in 1999 and features an animation technique that few do and one that Petrov does wonders with. Using a form of stop-motion that is achieved by carefully altering slow-drying paints on different layers of glass Petrov is able to conjure Hemingway’s simple tale to life with all the beauty and complexity of a rich oil painting. Every frame is a rich oil painting and the layers of glass allow for incredible depth, beauty, and nuance. Every time I see it I feel as though I am being transported into a dream. Petrov’s style is sumptuous and gorgeous and one can’t help but marvel at its stunning fluidity and life. 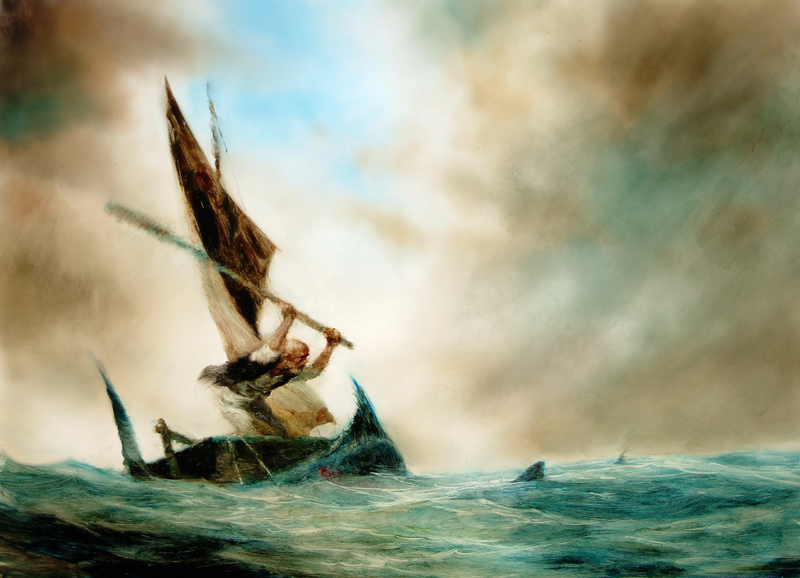 The old man, Santiago, goes off into the sea by himself to fish and there wrestles with a giant marlin and the elements. The movie stays true to its source material. All of Petrov’s films are incredible to look at and this one is no exception. There is an atmosphere and tempo all its own in this world and I strongly encourage you to visit it yourself. (approximately 20 minutes). The last film on my list today is a black and white live-action retelling of the story of the famous L. Frank Baum character, and it is titled Death to the Tinman (2007). I found this film online after watching director Ray Tintori’s earlier work, Jettison Your Loved Ones (2006). Tintori has also directed music videos including the memorably psychedelic “Time to Pretend” performed by MGMT. I was very impressed by what I saw in both Jettison and Tinman. The style is reminiscent of Guy Maddin and maybe Wes Anderson (if he directed Tetsuo), but something about it is all its own. The story follows the life of a lumberjack named Bill who lives in the town of Verton (the miracle capital of the America) in the early 1900s. 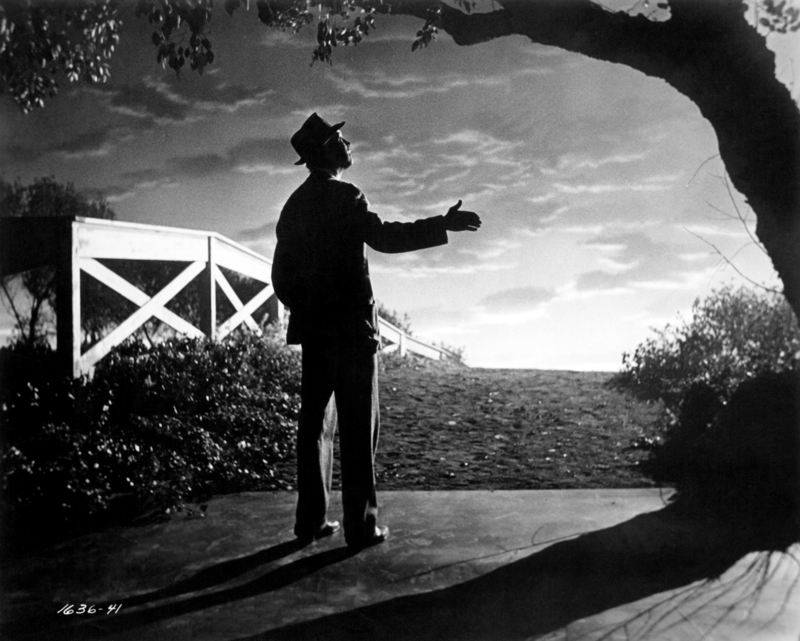 Bill is in love with Jane, the pastor’s daughter, as the narrator explains. The narrator also tells us that the town did not like Bill for many possible reasons, one being that his valor makes the other firefighters look like cowards. The pastor has God put a curse on Bill’s axe and so his arms are severed and his old friend Paul Mermlestein fashions arms of tin for him. Other accidents cause him to lose his legs and the rest of his body, leading Paul to make him a man of tin. Meanwhile Bill’s body parts have been stolen and put back together into a “meat puppet,” but they lack the heart that Bill still possesses. Jane, however loves the meat puppet. Things go from bad to worse as Bill does anything he can to win Jane back. The finale is wonderfully sublime, tragic, and heartbreaking, but clever and extremely rewarding. The humor, creative style, and fantastic score by Dan Romer and Benh Zeitlin make Death to the Tinman something you won’t want to miss. (approximately 12 minutes). Bonus: Ivan Ivanov-Vano and the amazing Yuriy Norshteyn staged one of the most incredible battles I have ever seen on film with Secha pri Kerzhentse (1971), and they did it all with stop motion religious icons. Check it out. (approximately 10 minutes). Short films have a certain freedom that many feature films do not. The best ones say more with less. They can be more streamlined and sometimes they can be a lot more weird. Be sure to check out I Met the Walrus, The Old Man and the Sea, and Death to the Tinman, but don’t stop there. Keep looking. 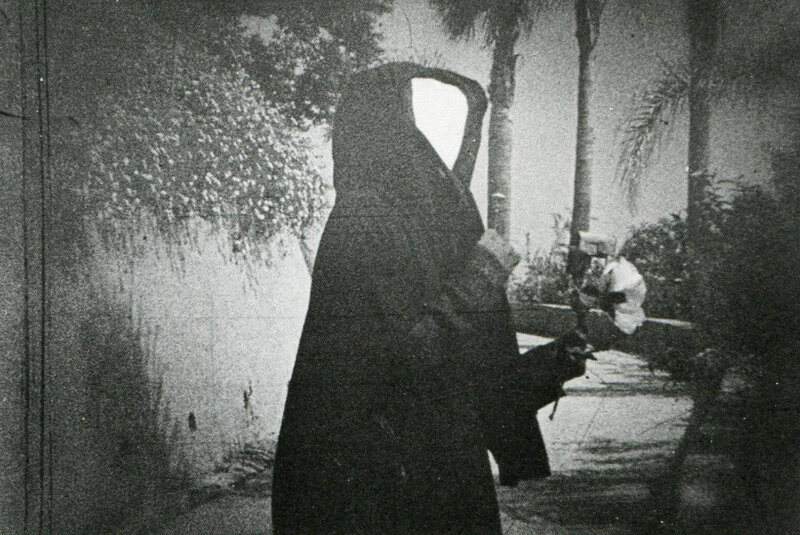 One more bonus short film to check out is Coleman Miller’s Uso Justo (2005) which uses found footage from an old black and white Mexican melodrama, but completely rewrites the subtitles into a very clever existential meta comedy in the spirit of Nietzsche and What’s Up Tiger Lily. Most of these films can be found online. I might have write about more short films in the future. What happens when med students LARP on the weekend? What happens when you surgically inject extreme rage directly into a baboon’s brain? 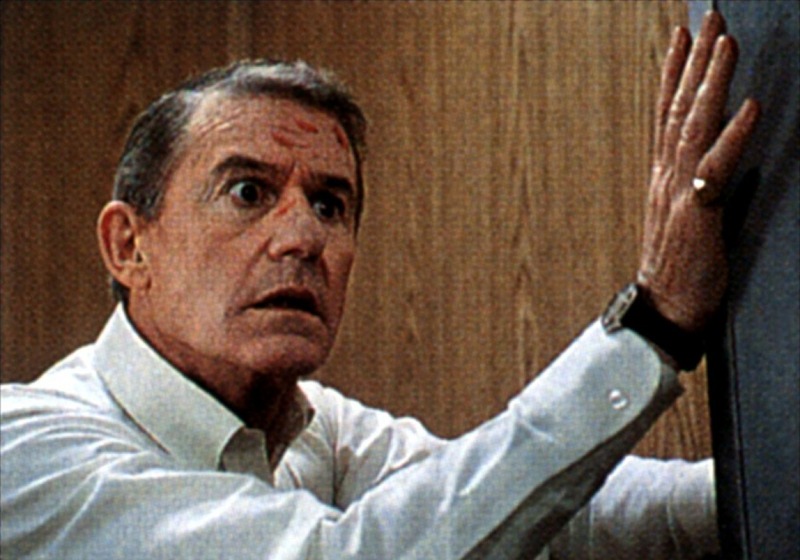 What happens when Roddy McDowell needs a paycheck? All these questions and not much more will be answered in Shakma (1990) directed by Tom Logan and Hugh Parks. Since there’s really not much to say about this truly unyieldingly awesome film I shall keep it all rather brief. Some research folks inject something that looks like urine into the brain of a baboon. Head scientist/doctor/professor, Sorenson (Roddy McDowell), then orders the tainted monkey to be put down. As night falls the students decide to play some sort of extra nerdy cross between Capture the Flag and Dungeons and Dragons in the facility. Weird set up, right? 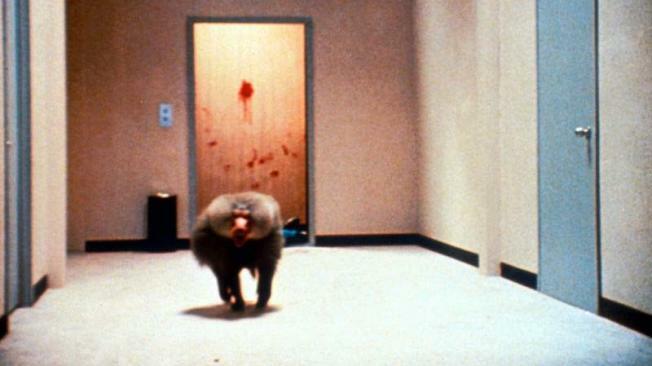 It’s really just an impetus to get the flat, young, nubile characters to wander the dark corridors of the the lab so they may be picked off one by one by the BABOON WHO ISN’T REALLY DEAD! I’m not sure if Roddy McDowell (who I really do like as an actor) was personally seeking out movies with monkeys in them or maybe his agent was or maybe the filmmakers thought he’d be perfect because he was in all of the The Planet of the Apes movies. In any event I feel sorry for him. He gets jacked up too soon…but then he was too good for this movie. The boring characters wander the halls only to stumble upon the mangled corpses of their friends. The handiwork of an enraged baboon perhaps? Most of the film consists of people walking through hallways, being surprised at the baboon, running and slamming doors shut, and finally the baboon (Shakma) banging his little body into the doors repeatedly. There is one pretty good kill in a bathroom stall (maybe more funny than good) and the ending is pretty decent, but other than that it’s a fairly bland and styleless “animal attacks” movie. The sterile, unnatural hallways of the medical research facility (?) reminded me of After Last Season but slightly upgraded. The real live animal performance is good I suppose. The baboon only has to be angry and slam into doors. The real hindrance that prevents the murder-baboon sub-genre of “animal attacks” movies from clicking is that the baboon is such a dim, dopey looking animal. 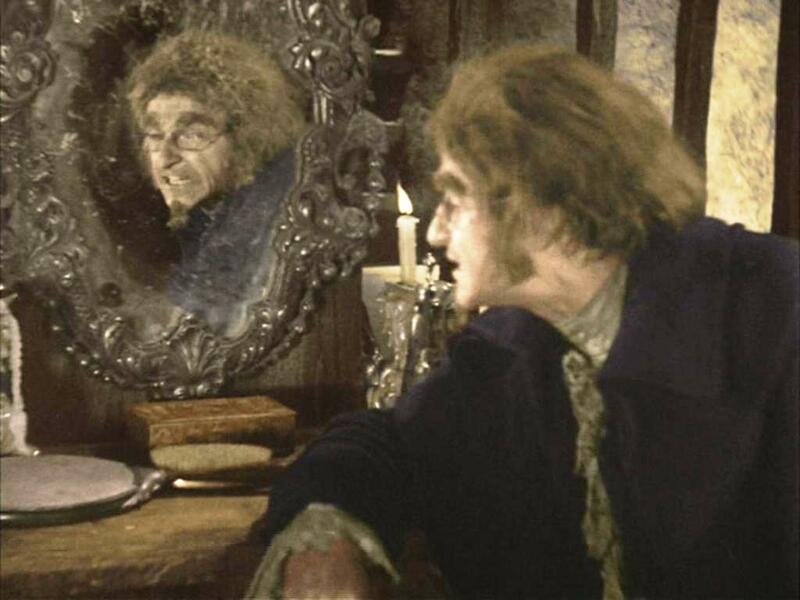 He has blank, glassy eyes and his stature is not very formidable (about the size of a mid-sized dog). He does have the teeth and he can bounce off walls, but when I think baboon I don’t think terror. I will give it this though: killer baboon makes more sense than killer shrews or rabbits. I only wish they killed the baboon my way—by donating it to Jeff Goldblum for his teleporter research. That might have been more satisfying. Speaking of Jeff, there’s even a few schticks in this movie that Jurassic Park (1993) might have nabbed if I thought anybody actually watched this movie. Basically Shakma is another run-of-the-mill brainless monster-kills-the-teens movie. It’s not particularly interesting or good. So why do I write about it then? Simply put, the name Shakma just demands to be repeated. Say it. Shakma. Yeah. You know it’s gonna bad but you kinda wanna see it. For a forgettably dopey movie about a rampaging murder-baboon look up Shakma. Or at least say it a few times and get it out of your system. Everybody loves James Stewart. It’s a fact. Look it up. He’s just a likable guy. The star of Mr. Smith Goes to Washington (1939), The Philadelphia Story (1940), It’s A Wonderful Life (1946), Rear Window (1954), and Vertigo (1958) picked up many fans. 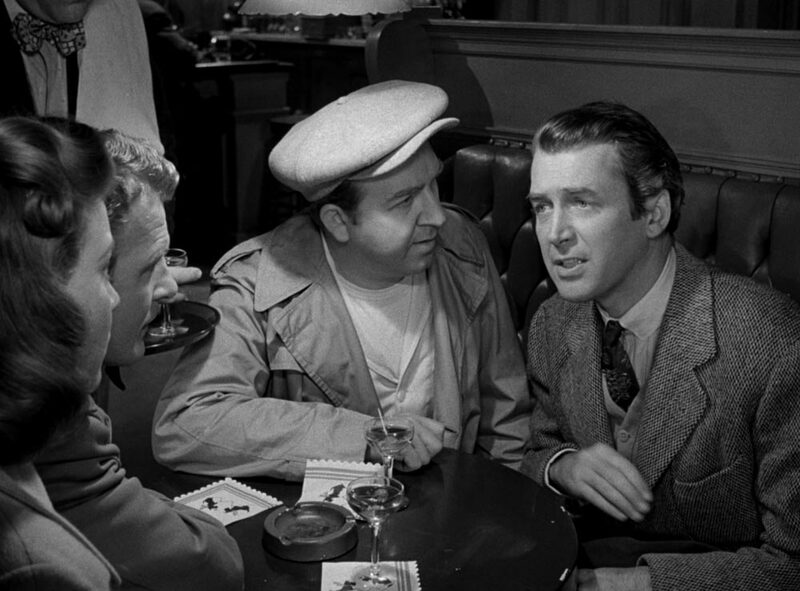 In an old interview James Stewart revealed that his favorite role he ever had was that of Elwood P. Dowd in Henry Koster’s light-hearted comedy, Harvey (1950). And it is surely worth a look. That is actually one scary rabbit. 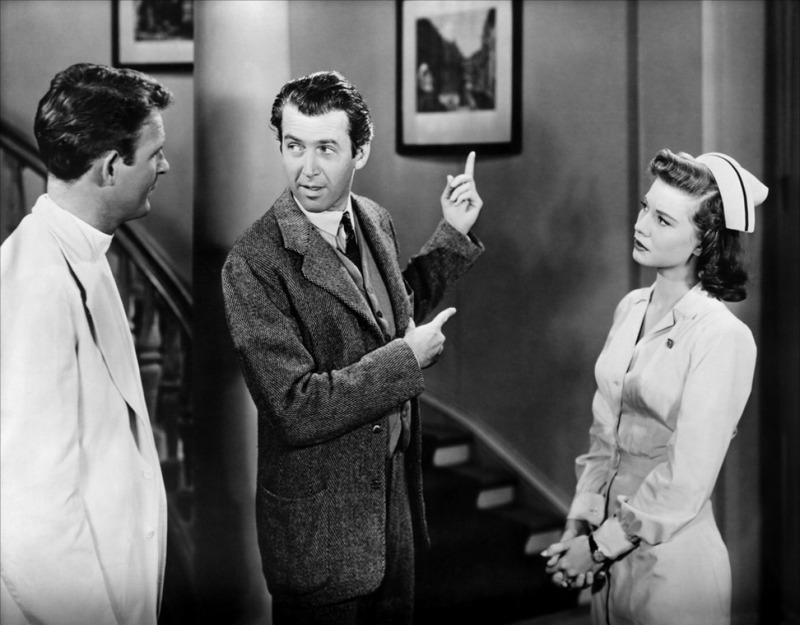 Perhaps James Stewart’s soft, gentle demeanor made him a natural for the role of the innocent and gregarious star of Harvey. Harvey itself is a great movie with a wonderful cast. 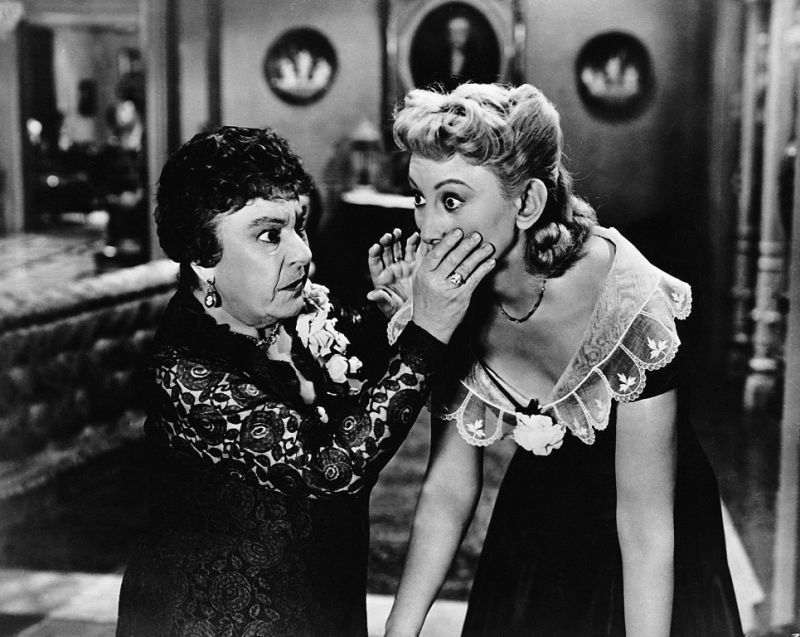 Victoria Horne (The Ghost and Mrs. Muir) is splendid as his love-hungry niece and the incomparable Josephine Hull (Arsenic and Old Lace) in her Academy Award winning role steals most of the show as his well-meaning, long-suffering sister at wit’s end. 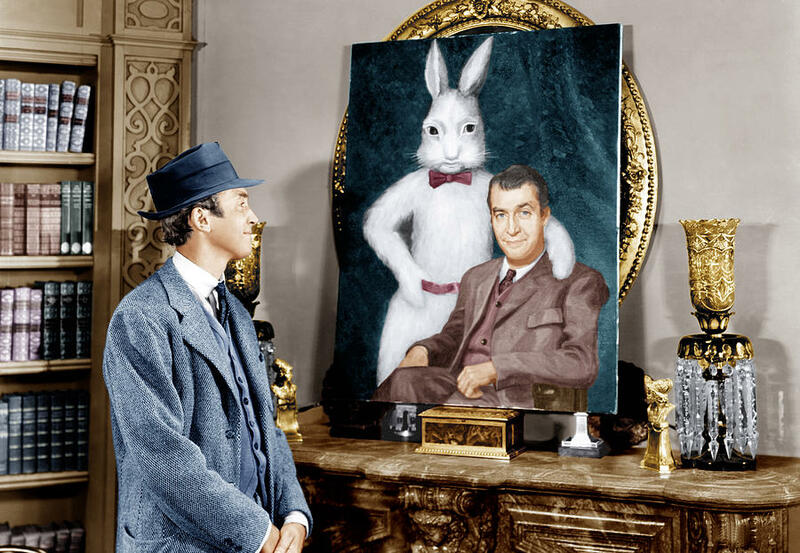 The real charm of Harvey lies with its sweetness and pleasantness that finds its root in the perplexing relationship between Elwood (Stewart) and his best friend, a giant invisible rabbit, six-foot one and a half inches tall. Josephine Hull and Victoria Horne in two wonderful performances. After living many years with her brother and his long-eared hallucination, Veta Louise Simmons (Hull), can stand it no more. Veta is going crazy trying to keep Elwood away from the house so she can entertain and throw parties for her upper-class friends, but Elwood continuously comes home from the local bar early and—very earnestly attempting to introduce Veta’s friends to Harvey—unwittingly chases them all away. Veta cannot have this. She loves her brother, but he is making it very difficult for her to get her daughter, Myrtle Mae (Horne), to meet young men. With no alternative Veta makes plans to commit Elwood to a sanitarium…but once there, her emotions take over when she’s describing how Elwood’s invisible rabbit friend is ruining her life and she winds up getting committed instead and the affable, oblivious Elwood wanders off with his head cocked up and to the right (to acknowledge his unseen friend) and an extra coat and hat (with two holes cut in the crown) over his arm. Once the well-meaning Dr. Sanderson (Charles Drake) and the nurse (Peggy Dow) realize their mistake of locking up a sane woman and sending the would-be patient off on his way they do whatever they can to fix it. Veta is released and gets her old family friend, Judge Gaffney (William Lynn), in an attempt to sue the sanitarium. The less-than-compassionate sanitarium orderly, Wilson (Jesse White), is sent to find Elwood and bring him in, but gets sidetracked when he bumps into a romance-desperate Myrtle Mae. Meanwhile sanitarium director, Dr. Chumley (Cecil Kellaway), is making plans to fire Dr. Sanderson and convince Veta to reconsider her charges. The amiable Elwood P. Dowd seems to be harder to apprehend than originally suspected…almost as if something (or someone) is protecting him as he blissfully saunters along on his merry way. If he really is crazy (however harmless) then he also might be invincible, but there seems to be clues that the ambiguously ambivalent rabbit, Harvey, might be more than just a figment of his imagination. Even if Harvey is make-believe, he’s real enough to the kind and gentle Elwood who will pull him out of traffic and hold doors for him. How do you capture a man who is too reasonable? Elwood eventually is found, but he goes peacefully (he hasn’t an unpleasant or disagreeable bone in his body), but the “sane” people who have been running around crazy for the entire film want Elwood to take a serum that will make him not see Harvey anymore. Sad that he will never see his best friend again, but not wishing to hurt his sister or niece, he agrees to take the treatment, but Dr. Chumley has something to tell Elwood in private first. To be smart or to be pleasant? That is the question. In the end it doesn’t matter if the rabbit is real or not. The important thing is how people treat one another, and if it takes a magical, invisible rabbit to change people then so be it. I don’t want to give too much more of the plot away, but hopefully I have whet your whistle enough to watch the film for yourself. Harvey is funny, touching, and beautifully written and might be one of the most pleasant movies ever. Harvey is wonderful, charming fun for the whole family. 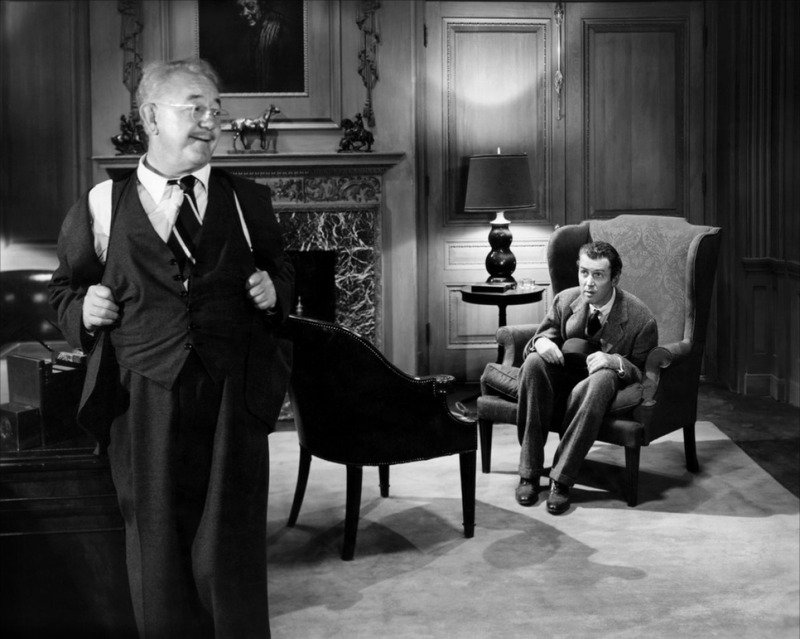 Still Marching: A Laurel and Hardy Kind of Thanksgiving…or any other time of the year. It doesn’t exactly matter. Everybody remembers the Disney “Babes in Toyland” (1961), but do they remember us?! 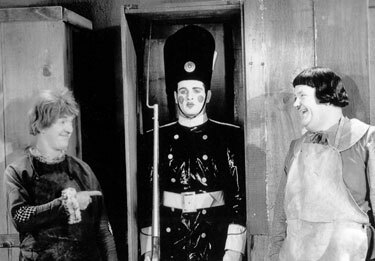 Perhaps there is nothing remotely binding between the holiday in which we partake of turkey and welcome family fellowship with the obscure 1934 Laurel & Hardy musical March of the Wooden Soldiers (a.k.a. Babes in Toyland). All I know is that at my house growing up, it wasn’t Thanksgiving without this odd comedy (it used to be a holiday staple on TV in the 60′s and 70′s). 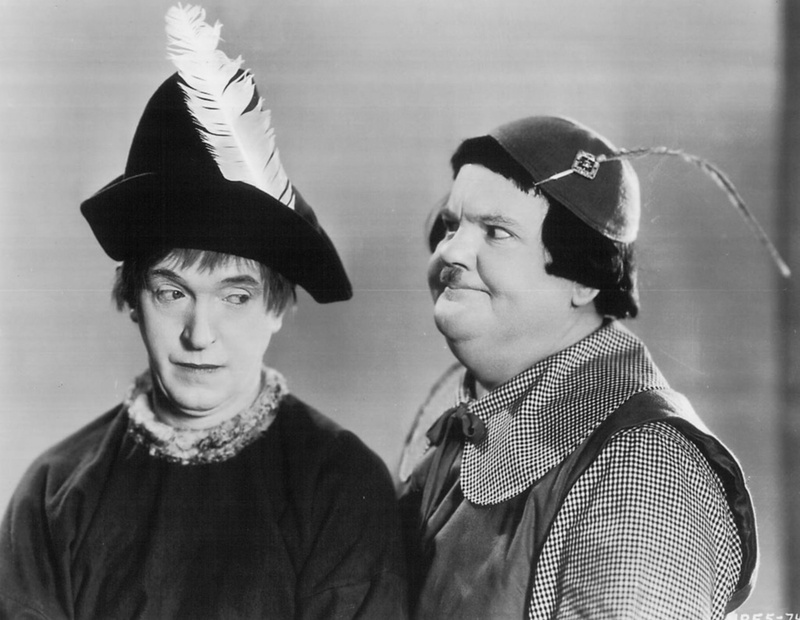 The film stars the legendary comedy team of the infantile Stan Laurel and the rotund Oliver Hardy and features an interesting—and sometimes dark—peek into the world of fairy tales and nursery fables. Santa Claus. Because Thanksgiving is just a primer for Christmas. My deep admiration of Laurel and Hardy clearly influenced my enjoyment of this twisted yarn, but even for the uninitiated this film has undeniable charm and an incorrigible sense of whimsy…but it wouldn’t hurt to enjoy some of their other work and funny shorts first. The duo’s shtick was a basic one: two grown men with extremely childlike sensibilities saunter in and out of trouble while the softer more naive Laurel inadvertently causes more duress for the more domineering Hardy. They would put these characters into many situations and milk the comedy out of any circumstance and, naturally, the darker the dilemma the funnier the situation. Like Abbott and Costello, Laurel and Hardy were always funniest to me when they were up against monsters, killers, ghosts, psychos, gangsters, etc. 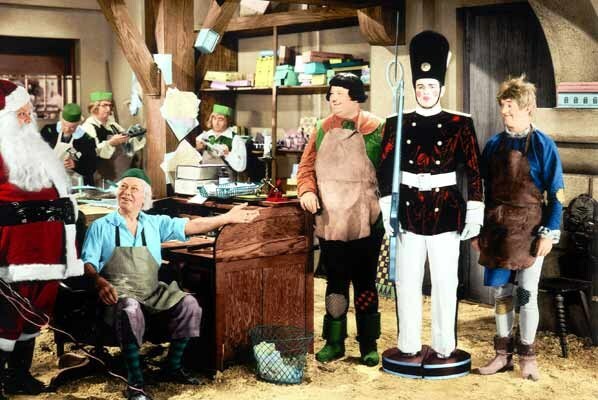 and in March of the Wooden Soldiers (directed by Gus Meins and Charley Rogers) they bounce from delightful childhood storybook characters to an army of Bogeymen led by the conniving Crooked Man, Silas Barnaby (Henry Brandon). Silas Barnaby, he Crooked Man of Toyland. Based on Victor Herbert’s 1903 operetta, the story goes like this: Silas Barnaby is the wealthiest and meanest man in town (you don’t get rich by being nice to people), and he is in love with Little Bo-Peep (Charlotte Henry), but she loves the gallant Tom-Tom Piper (Felix Knight). 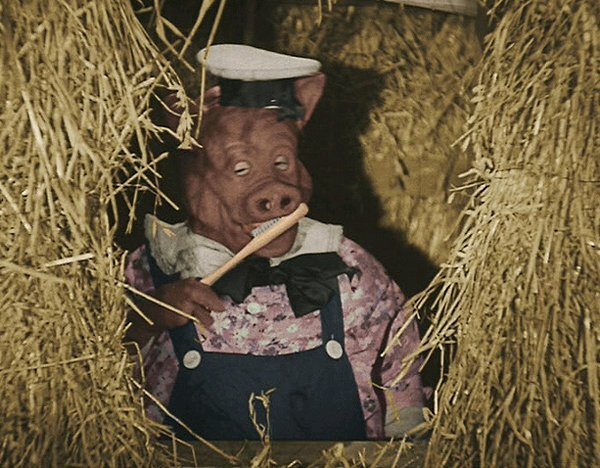 Barnaby will not be beat so he frames Tom-Tom for pig-napping one of the Three Little Pigs and then furthers the deed by making it look as though Tom-Tom also ground him into sausage. Ollie Dee and Stannie Dum (Laurel and Hardy), two boarders with the Old Woman Who Lived in a Shoe (Florence Roberts) and friend of Bo-Peep, suspect foul play and so embark on a mission to find the truth…but get themselves arrested for burglary when they try to steal Mother Peep’s mortgage back from Barnaby. Screwball mishaps abound as the lovable duo rub elbows with Mother Goose, Rock-a-bye Baby, Old King Cole, Mary Quite Contrary, Santa Claus, the Sandman, and many others. 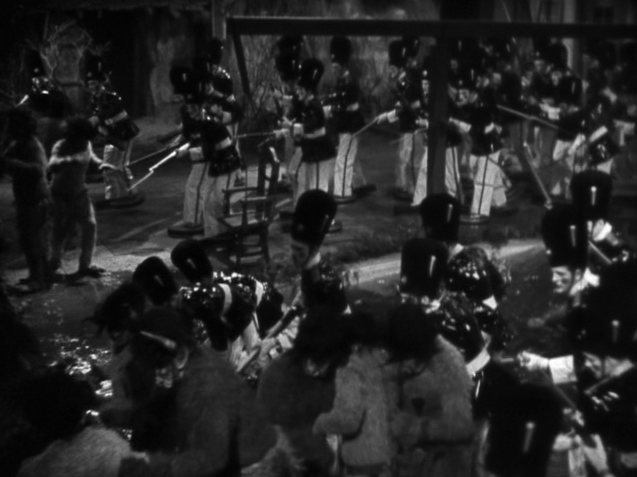 There are five musical numbers including the memorable “March of the Toys” instrumental piece that plays during the final battle when Laurel and Hardy unleash 100 giant Wooden Toy Soldiers on the vicious Bogeymen. The battle at the end is a lot of fun. All the characters band together to fight off the onslaught of monsters in their own unique ways. March of the Wooden Soldiers is a funny, entertaining, scary, bizarre, and fun Thanksgiving adventure for everyone. I will be the first to admit I was never a fan of most of the singing, but as I get older I appreciate its campy oddness more and more. The last march of the ents. 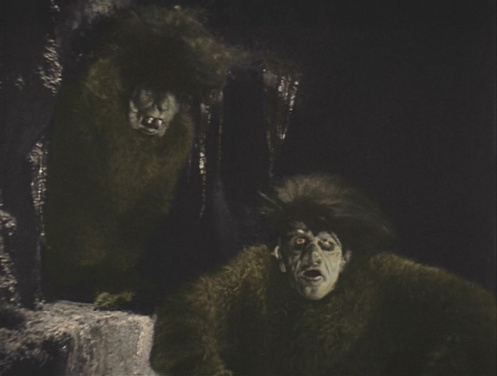 Personal notes: The Bogeymen are actually not the scariest part of this film. 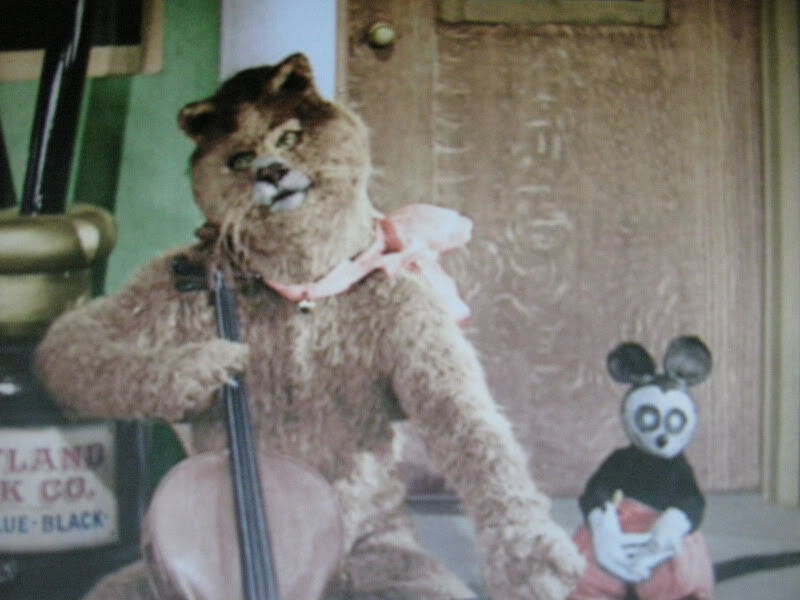 My family and I have always been slightly perturbed by the weird rubber pig costumes and the glassy eyed cat playing the cello (pigs and cat all played by people in suits). Another spooky aspect (but somehow absolutely fantastic in an incredibly deranged way) is the presence of Mickey Mouse. I’ve heard that they couldn’t get the rights from Disney (little surprise), but they still have a black mouse character with round head and ears, white gloves, red trousers, and yellow shoes. The spooky part: Mickey Mouse is played by small monkey that has been freakishly adorned to vaguely resemble the iconic rodent. 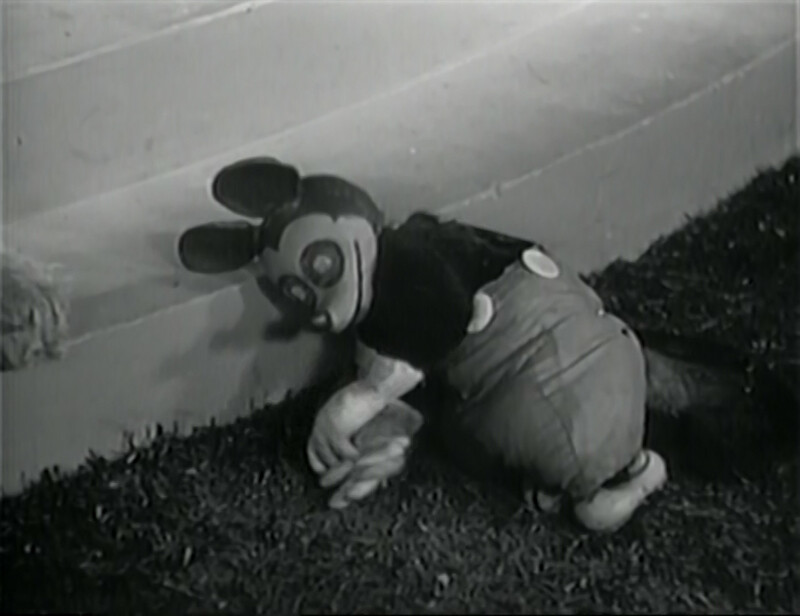 The Mickey Mouse creature scrambles around, throwing bricks at the cat and is easily one of the coolest parts of the Bogeyman Battle (I won’t ruin it), but it is still slightly unnerving. 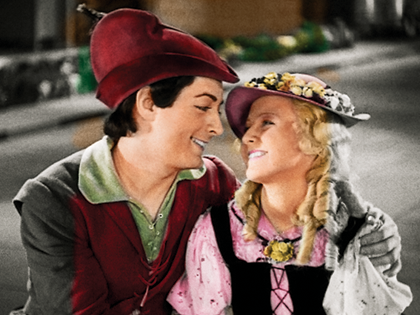 Last note: This film is one of those rare movies that really benefits from the computer colorization process. Originally shot in black and white, the colorized version actually works for the film’s strange artificiality and brings a lot more surreal magic to this already kind of special movie. See? Spooky man in cat costume and monkey in Mickey Mouse costume. One more time! Mouse monkey!!!! Yeah, it’s weird. This celebrated classic may be strange, but I encourage you to invite Laurel and Hardy and the rest of Toyland into your home this Thanksgiving. Or any time of the year really. This movie isn’t themed to any holiday technically. It’s not really a great movie either. But it’s kinda kitsch now, I suppose. It doesn’t exactly matter. Originally published for “The Alternative Chronicle” November 25, 2009. A friend had randomly sent me a link to some wild scenes from a crazy Kollywood movie (Indian film in Tamil rather than Hindi which would be Bollywood). Instantly smitten with the footage, we sought out the complete movie almost immediately and watched it in all of its absurd 3-hour long glory. This was no pensive and delicate Satyajit Ray tragedy epic. This was S. Shankar’s Endhiran(2010). If you saw Slumdog Millionaire and think you know Indian cinema, guess again. As my title playfully hints, Endhiran (aka Robot) is a bloated, mismatched hodge-podge of the Matrix movies, the Iron Man movies, the Terminator movies and whole mess of other American science-fiction action fantasy flicks. At the time it was the most expensive movie made in India and, although it’s pretty dumb, I found it to be more fun and more innovative than half of the films it was ripping off, and I don’t say this much (as I generally dislike the current gimmick of 3D) but I kinda wish Endiran was in 3D. Where to begin? Popular Indian actor, Rajinikanth, plays Dr. Vaseegaran, a brilliant scientist with good intentions (always), who creates an amazing humanoid robot (also played by Rajinikanth) named Chitti Babu after the famous Indian veena musician. The robot is fast, strong, powerful, super-smart, magnetic, charismatic, knows kung fu, and has the ability to seemingly ignore the laws of physics when the action calls for it. Chitti falls in love with Dr. Vaseegaran’s fiance, Sana (played by the gorgeous Aishwarya Rai), and so the jealous doctor destroys him and then the android’s battered parts find their way into the hands of the evil Dr. Bohra (Danny Denzongpa). Things go wrong and the new evil Chitti kidnaps Sana and makes hundreds of deadly powerful duplicates of himself. It is up to Dr. Vaseegaran to rescue Sana, stop Chitti, and set the world right again. It takes the film 3 hours to convey this plot. There are plenty of amusing subplots that happen along the way. Two bickering lab technicians who helped construct Chitti try to play tricks on him. Dr. Bohra tries to disgrace Dr. Vaseegaran. Chitti helps Sana cheat on her doctor’s exam (that actually worries me a little). Chitti has an in-depth conversation with a colony of mosquitoes to prove his love for Sana. He even rescues several people from a burning building (a la Spiderman) but things go wrong when he rescues one girl from the fire who happens to be naked and she runs out in front of a speeding bus to commit suicide out of shame. The little naked girl suicide really kinda shifted the mood of the film for me, but Chitti makes up for it by immediately delivering a baby! Another recurring theme is that Sana keeps getting near-raped by greasy dudes. Really though, all of these minor plot points and small character adventures take a back seat to the fun action sequences. Rajinikanth does a fine job playing the naive doctor and the charming but rigid Chitti and then the evil Chitti and all his duplicates. At over 60 years old—in addition to having one of the biggest age differences between himself and his onscreen love interest since High Noon—he had to do a lot of running around for these dual roles (and then some). Aishwarya Rai is very lovely to look at and you can tell she seems to be having fun as the much sought-after damsel in distress. But the special effects! I must be honest that the special effects are actually pretty good (much better than a lot of Indian films I’ve seen), but that’s not what makes them so great: it is the imagination they use to choreograph the super-stylized action and effects. Srinivas Mohan, visual effects supervisor, had his work cut out for him as so many scenes are little more than huge kaleidoscopes of digital engineering. ILM and Stan Winston Studios also lent their effects expertise to the film and the results are quite impressive. There is an excellent car chase to rival Matrix Reloaded and a smashing sequence in which the evil Chitti duplicates join together to form a death ball, a giant snake, a drill, and a huge dude (among other things) that might give Matrix Revolutions a run its money. Machine guns, explosions, car chases, robots, sunglasses, talking mosquitos, and Aishwarya Rai are just a few reasons to check this film out. And what Bollywood/Kollywood film would be complete without some wild song and dance numbers? The film travels all over the world for the many zany music video sequences (why they seem to be singing about Mount Kilamanjaro whilst dancing in Machu Picchu is beyond me, but whatever). From an American point of view these sequences can seem like a huge waste of time, but I actually enjoyed them. It reminded me that Endhiran was from a different culture with different values than that of the land that brought us Transformers. It let me enjoy the poofy hair and unusual clothing even more. I liked listening to the music and watching all the wildly dressed extras and extravagant backgrounds. This movie was made to be a show and I’d say they succeeded. One note on all the musical numbers I have comes from cultural ignorance and it is this: if they hadn’t drastically changed the setting for every song I don’t think I would have been able to tell them apart. I mentioned a few times earlier that this movie is 3 hours long. At first that number startled us. Having seen the trailer and a few clips I wasn’t sure how such a fluffy action movie could stand to go on for so long. Seven Samurai this was not. Having said that, I will further attest to the miracle of editing. Endhiran is so frenetically cut together that we were all bewildered when we realized that what felt like 15 minutes turned out to be an hour. The pacing of this freight train of a film is vigorous to say the least. It’s also a bit disorienting at times, but I’d say that just adds to the absurd experience of watching this thing. At the end—and it does end well—it felt more like 90 minutes and we found ourselves wanting even more mayhem. What started out as an endurance test for foreign oddity transmogrified into an extremely pleasurable afternoon of entertainment. 1. Playing a quirky, charismatic, multi-faceted superhero at Rajinikanth’s age earns him mad Ron Perlman Hellboy points. 2. Aishwarya ain’t too shabby. 3. Despite the language barrier it’s got some great super-cool action movie lines. 4. If you’ve never seen a Kollywood/Bollywood movie this is as good a place as any to start. 5. They spent a lot of money on this garbage so help these guys out. 6. 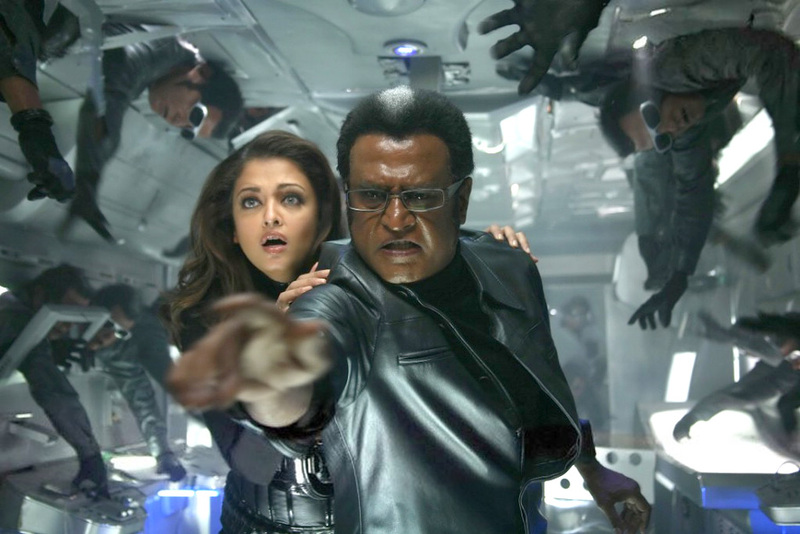 Chitti looks like an obscene amalgam of Johnny Cash, Jon Belushi, and Deep Roy. I liked that. Maybe you will too. 7. If you thought you’d seen it all, watch this to get humble again. 8. At times it approaches Kung Fu Hustle status for action ludicrousness. 9. It’s about as action-packed and insubstantial as Tony Jaa’s Ong bak: Muay Thai Warrior so you don’t have to think for 3 whole hours! 10. Robot death ball. Dot!